There’s no doubt about it: The Rocky Mountain Instinct 970 MSL BC Edition sparked some serious emotions in our testers, leading to this robust and unfettered debate about what wheel size actually means. Check it out. Final Take: What's a North Shore-bred 29er ride like? Like this—a trail bike that punches above its weight class. That trope about 29ers being no good in tight and hectic conditions? It's crap. 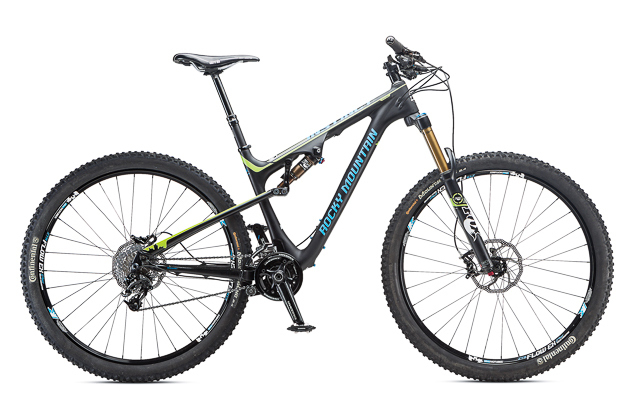 Consider Rocky's new BC Edition Instinct, a 29er bred on Vancouver's rugged North Shore trails. It is basically a trail bike the way the guys at Rocky ride `em. To match the rigors of the Shore, the bike comes equipped with a stout Fox 34 Float 140-millimeter-travel fork, wide 785-millimeter bars, fat 2.4-inch Continental tires mounted to 25.5-millimeter wide Stan's ZTR Flow EX rims, a chainguide and Avid Elixir 9 Trail four-piston stoppers. While the rear suspension on the Instinct doesn't qualify as plush by most riders' standards, it was more than up to the task on the small and medium hits of our test loop. Bottoming out wasn't a problem on bigger hits, but the rear suspension didn't feel as lively as some of the other test bikes with similar travel. At a hair more than 30 pounds, the Instinct wasn't the lightest trail bike on test, but it still gained elevation with ease. No doubt the big wheels helped here, but credit also goes to the neutral-pedaling suspension, which provides ample traction with minimal bobbing.